I pulled my orifice tube and it was covered with black gunk no metal that I can see. How do I tell if my compressor is good? I want to flush the components is it possible to flush the condenser or a waste of time. I have rear A/C do I have to pull the expansion valve or can I just flush it ? This all happened because the high side valve was leaking so I have to replace that or a whole new manifold set. That's what I thought. Is there a better compressor than the original? people talk about the sanden. What about the hose assembly can you flush the muffler in it? That OT looked just like the one I pulled out of my 98 chevy K3500 about a month and a half ago. I replaced everything except the evaporator on it. I just got done working on a 99 Suburban yesterday but the OT was perfectly clean so I only replaced the compressor and accumulator. I did not take apart any of the rear lines on this vehicle. I used the Sanden compressor but have used the Seltec/Valeo compressors on two of my 98 chevy trucks. I bought mine through Ackits.com. When I ordered the compressor for this Sub, they were out of the Seltec compressors so I got the Sanden. The high side on this sub had the shrader valve in it instead of the ball valve. You cannot flush through the muffler in the hose assembly. good luck. Should have either of the 2 compressors available in a week or so. Have the Sanden in stock now. 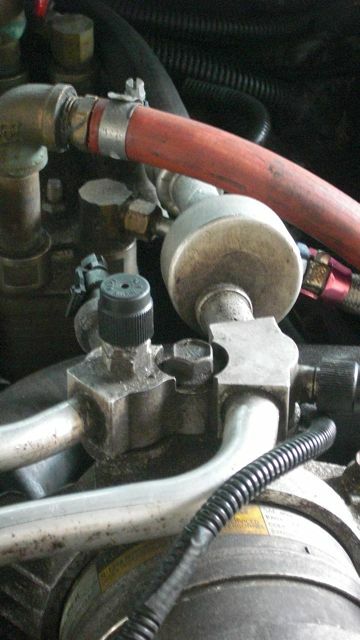 Does that compressor hook up to the manifold hoses and bolt to the engine the same as OEM? Both the Seltec and Sanden compressors bolt to the stock AC mounting bracket on the truck and the manifold hoses bolt to both compressors just like stock. The Seltec compressor is a direct bolt on with nothing extra needed. The Sanden compressor may need to be installed with the provided 1/4" thick washers and possibly a longer belt. The way the body of this compressor is made, makes it come in very close contact with the mounting bracket the compressor sits in. On the 99 Suburban that I just did, I was able to mount the Sanden compressor to the stock mounting bracket without using the 1/4" washers but it was very very close. Probably a hairs width between the compressor body and bracket. I did have the compressor bolted down to factory torque specs. You could also slightly notch out the mounting bracket if you had to if you didn't want to use the washers. The bracket is aluminum and would be easy to do and you shouldn't have to remove much material. Thanks that's great does anyone have the template for cutting the rear A/C box I read the post but there is no template. I hope to rebuild the entire a/c so its nice and chilly I want to flush front and rear evaporators out and replace the rear expansion valve. I don't know if you have a subscription to alldata for your vehicle but its a pretty good resource and you would have access to all of the TSB's that apply to your vehicle which should have the template. I have a subscription to all of mine. Why should expansion devices not be flushed and why the muffler on a hose assembly cannot be flushed.What is it( the muffler)and where on the hose assembly is it ? Flushing through an expansion orifice impedes/negates the flush flow rate needed to effectively clean the component. You need a good open path for effective volume flushing. A small piece of debris stuck at the orifice would stop any flow and could not be pushed through. Even if you are successful at pushing solvent through the orifice, the next problem is that you will not be able to push the volume or dry air or nitrogen needed to dry out the component. The muffler (can) in the line is a baffle, sometimes just staggered plates inside, sometime plates with holes, sometimes nothing. It is because of the unknown internal design, that makes flushing this device not recommended. Thanks for the info,that was a mouthful! !